The Seahawks are Super Bowl Champs. The best team in football. Players want to be with them, teams want to be like them. So starts the Dynasty Off-Season for one of the youngest teams to ever win the Lombardi Trophy. This series will dig into each position group, look at who we have, who might be available, and what the team may do in each area. It will end with a projected off-season plan. You can check out last season’s analysis here. They have been largely accurate, so if you want to know what Seattle will do before they do it, look no further. It was fitting that after all the attention given to the Legion of Boom and the dominant Seahawks defensive line, that a back-up linebacker won the Super Bowl MVP. This linebacker unit had an uneven 2013, impacted by injury and positional shifting, but finished the year as an elite group that looks like it could grow stronger heading into next season. I do not even to look up historical numbers to tell you that no linebacker has ever had a season like that. Six games is six games, sure, but it is not like he did this for two games. Smith did this against some of the best competition the team saw, and in the biggest moments. Never forget that while Richard Sherman’s tip was the iconic moment of the NFC Championship victory, it was Smith who was there to make the interception. One could argue it was Smith’s pick-six in the Super Bowl that broke the game open. He now enters his contract year as a 25-year-old Super Bowl MVP, and the presumed starter at weakside linebacker for the World Champs. 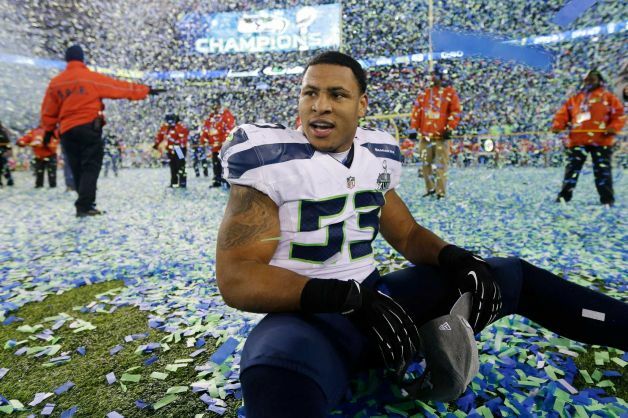 What a year for Malcolm Smith. You also have an All-Pro. Wagner also added two picks. He is a versatile talent who can be a factor against passes in coverage or as a pass rusher, and against the run. He had only one tackle for loss this season, well off the 6 he registered in his rookie season. That is a key measure for a middle linebacker, as it helps to tell the story of whether a player is reading and blowing up plays versus catching running backs after they come through the hole. Wagner still has upside beyond what we have seen. He may not quite be Luke Kuechly, but he may not be far off either. Wright had a good, but not great season. He enters his contract year with a reputation as a guy who can play any of the three linebacker spots, and is excellent in coverage. Wright was hurt by his versatility this season as he really played out of position as a weakside linebacker until Smith emerged. Seahawks coaches wanted to create room for Bruce Irvin at strongside linebacker, and shifted Wright to weak. Irvin played a very solid strongside linebacker, but was not as dynamic at the position as Wright, which meant the Seahawks were really not optimizing their talent. The Super Bowl gave the best view of what next year could look like with Wright playing his best position at strongside and Smith at weak. Wright finished with 7 tackles, and a TFL. Irvin had only one game of more than 6 tackles and had just one TFL all season. Wright is a very good–but not quite Pro Bowl–player. The team would be wise to let him excel where he plays best, and that is what they will likely do. That means Irvin needs a new home. Fans will want to pile on Irvin, but that’s not really fair. He played well at his position, a new position for him. He was good in coverage and very good at setting the edge against the run. We all want to see big sack numbers, but the team very rarely gave Irvin the chance to rush the passer. It seemed like this move to linebacker would allow him to roam the line and attack from different spots, but he mostly just stayed home, and was often off the field for nickel situations. Most will see the 2.0 sacks this year and start calling him a bust. I don’t see that. Not yet. He had 8.0 sacks as a rookie when given the chance to rush the passer. They need to put him in a position where he can do that more regularly. I expect that to involve more snaps as an edge rusher like he was as a rookie. The problem will be that he and Avril are best at rushing from the same side. They may try Irvin more at LEO, but only in passing situations. It is one of the bigger questions heading into training camp. Reader, Paul Milem, reminded me that I forgot to discuss Korey Toomer. He is definitely someone who will impact the team’s off-season plans, and it is yet to be determined where he can best provide depth at linebacker. He is incredibly fast, and a better pass rusher than run defender. The team was very high on him coming into this season before an injury derailed him. He was slotted as a strongside ‘backer, which would create quite the pile over there with Wright and Irvin and possibly O’Brien Schofield. If he could be a credible backup at weakside, that would be solve for one of the meaningful needs for the team this off-season. He is definitely fast enough, and he is built more like Smith than Wright or Irvin. He is under club control through 2015, so it is in the Seahawks best interest to give Toomer every chance to succeed. These numbers are provided by OverTheCap.com, and represent what the Seahawks currently have on the books to spend at the position in 2014, as well as where that ranks in the NFL. Being ranked #1 means the team is spending more at that position than any other team, and #32 would mean they are spending the least. This is somewhat deflated because I believe Bruce Irvin is counted as a defensive end. Still, the Seahawks are not big spenders at linebacker, and likely never will be. Seattle may fill in with some cheap veteran depth, but do not expect any flashy signings here. They need to find players who could step in should the team have to part ways with both Smith and Wright after next season. If they see a young guy who could fit the bill in free agency, they could grab him. Schofield is a guy I expect the Seahawks to give serious consideration to re-signing. He can play strongside linebacker and is a legitimate option at LEO. Give him Chris Clemons’ snaps next year, and he very well may out-produce the 4.5 sacks Seattle got there in 2013. He is also a good special teams player, and Carroll likes him a lot. He did not do enough last season to command a big payday, so look for him to explore the market, and then possibly accept another short deal (he is only 26) that could put him back on the market with more earning power. Wright and Heath Farwell act as back-up options to Wagner, but Farwell makes $1.5M, and could become a cap casualty at age 32. Angerer is a great special teams player who is just 27. He could provide some depth inside and cost less than Farwell. Seattle would do well to find at least two linebackers either in the draft or as undrafted free agents. It is a shame they had to part ways with a guy like John Lotulelei, who was the perfect combination of cost, potential and special teams value. He was undrafted. Allen Bradford, also no longer with the team, was undrafted. Smith was a 7th round pick. Wright was a 4th. This team should be able to find some value later in the draft. The Seahawks linebacker corps could go from solid-to-good next season. Wagner continues to have the highest upside, although, Irvin could be a major play-maker down the road if the parts fall into place for him. Smith is a playmaker right now, and almost certainly is playing his last season as a Seahawk. Wright is steady and occasionally spectacular. His future is a little more cloudy, as his price may be reasonable. The front office has to plan as if they will be missing two starting linebackers after this season. Irvin has already proved he can be a solid strongside linebacker, even if it did not allow him to stand out yet. Schofield could be another option there. Should Wright leave after next year, the team also lacks depth behind Wagner in case of injury. Finding at least two rookie linebackers they can carry on the roster is key, and possibly picking up another cheap, young player through free agency would make sense. The best news here is that finding linebackers is among the easiest tasks for a team, and Wagner is here for at least two more years.